The deepening standoff raised questions of whether two strong-willed leaders were risking even broader chaos as they vied for the upper hand in a widening diplomatic dispute largely focused on individual personalities. ISTANBUL — A worsening dispute between the United States and Turkey reverberated through the global economy Friday, hastening a broad flight of money from emerging markets and sowing instability throughout the Middle East as relations between the two countries neared a breaking point. The immediate crisis — accelerated by a hostile tweet from President Donald Trump — flared over Turkey’s continued detention of an American pastor, Andrew Brunson, who was jailed 21 months ago in a widespread crackdown after a failed coup in Turkey. But the outsize effect reflected deepening concerns over Turkey’s economic management by President Recep Tayyip Erdogan, who was re-elected in June with near-authoritarian powers. It also increased the risk that the problems in Turkey, which borders Iran, Iraq and Syria, could destabilize economies well beyond the region. Turkey’s economy is only the 17th-largest in the world, but its problems are worsening as Trump’s trade war is rattling global commerce, damaging longtime alliances and threatening economic growth worldwide. There is also widespread fear among foreign investors that the populist, authoritarian government of Erdogan is pursuing irresponsible economic policies while undercutting the independence of the central bank. That, analysts fear, is preventing the country from taking the necessary steps to put the economy on a more stable footing. Turkey’s currency, the lira, which traded at 4.7 to the dollar a month ago, weakened to 6.4 to the dollar Friday — the first time ever that it took more than 6 lira to buy a dollar. The lira has lost more than 30 percent of its value this month — roughly half it this week. Seeming to sense vulnerability, Trump piled on pressure and announced additional economic sanctions — doubling tariffs on imported Turkish steel to 50 percent and on aluminum to 20 percent — after having already penalized two Turkish government ministers last week. The move effectively priced Turkish steel out of the U.S. market, which accounts for 13 percent of Turkey’s steel exports. “Our relations with Turkey are not good at this time!” Trump wrote. The deepening standoff raised questions of whether the two strong-willed leaders were risking even broader chaos as they vied for the upper hand in a widening diplomatic dispute largely focused on individual personalities. An evangelical preacher, Brunson, who has lived in Turkey for 23 years, is one of about 20 Americans, including a NASA scientist and chemistry professor from Pennsylvania, who have been swept up in Erdogan’s crackdown since the failed coup two years ago. Erdogan says the coup was orchestrated from the United States and specifically by a Muslim cleric, Fethullah Gulen, from his self-imposed exile in Pennsylvania. Turkish authorities have demanded that he be extradited, something U.S. officials have dismissed, and the detained Americans are widely seen as bargaining chips. Erdogan has shown no sign of backing down. He sounded defiant in two speeches to supporters Friday, railing against foreign powers that he accused of orchestrating Turkey’s economic crisis and vowing not to bow to Western pressure. Both the U.S. and Turkey are members of NATO. The breakdown was surprising, she said, because Trump had appeared to reach the outlines of an agreement for the pastor’s release with Erdogan on the sidelines of the NATO summit last month. In exchange, the United States agreed to arrange for a Turkish banker, Mehmet Hakan Atilla, who is serving a 32-month prison term in the United States, to be returned to serve the remainder of his sentence in Turkey. After his meeting with Erdogan, Trump even threw in an extra favor, asking Israel to release a Turkish detainee, Ebru Ozkan, who was quickly freed. The U.S. wanted Brunson released immediately, but the formalities of the Turkish banker’s transfer were expected to take two or three weeks, according to Aydintasbas. The deal has not happened, she said, as Turkey has held out for further guarantees, including the lowering of a fine by the U.S. Treasury against the state-owned Turkish bank Halkbank for conspiring to violate U.S. sanctions against Iran and a promise to cease any further prosecutions. According to one U.S. official, Turkey had been given a deadline to release Brunson, who is now under house arrest at his home in the Turkish coastal city of Izmir, by 6 p.m. Wednesday. Turkey had seemed to be trying to stave off the crisis by scrambling a delegation to travel to Washington, D.C., for more talks that day. The talks did not go well, said a second U.S. official. “The conversations continue,” said Heather Nauert, the State Department spokeswoman, after the discussions. By Friday, Erdogan seemed determined to tough it out. He called on Turks to sell their gold and dollars and buy lira to bolster the Turkish currency. The lira’s plunge has sent shudders through financial markets because it has raised doubts about investing in Turkish securities. The yield on Turkish 10-year bonds has risen sharply, to more than 20 percent, which means traders are demanding much higher returns for what they see as an increasingly risky investment. The anxiety extended to doubts about Asian and European banks that have heavily invested in Turkey, and it contributed to declines in stock markets around the world. As with the financial crisis set off by Greece in 2010, Friday’s events were the latest example of how troubles in a nation with a midsize economy but world-class problems could threaten financial stability further afield. In power for 15 years already, Erdogan’s popularity has depended greatly on his ability to bring Turks continued economic growth. It has created a middle class beholden to him, even as he has trimmed civil liberties, jailed opponents, and constrained traditional and social media alike. He called snap elections this year, a year and a half ahead of schedule, driven in part by signs that the economy was faltering. Yet the lira plunged even in the midst of his re-election campaign. 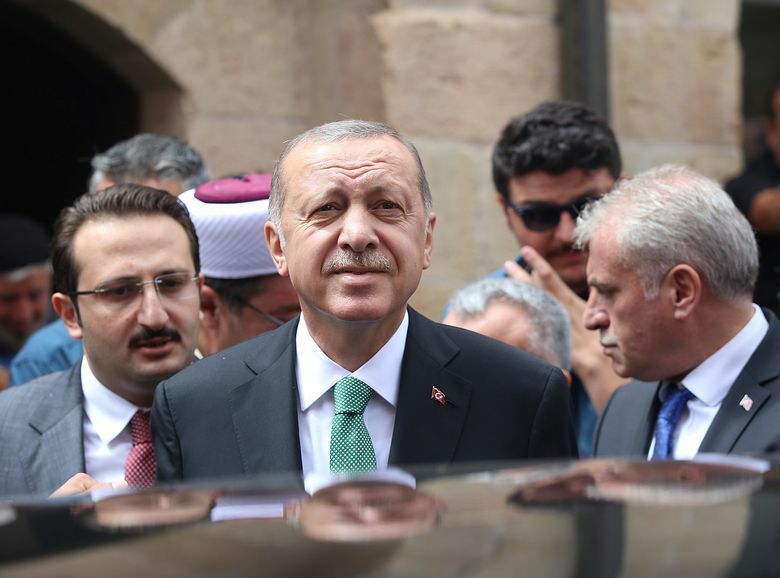 The economic trouble has only worsened in the weeks since Erdogan acquired sweeping executive powers after his re-election to a newly enhanced presidential system in June. The currency’s sharp decline has reflected concerns about the fundamentals of Erdogan’s economic model, which has depended on a voracious construction industry that his opponents say has enriched his inner circle while heaping debt on the country. The even steeper fall in the lira since Erdogan’s re-election is now fueled by worries that he is ever more insulated and is taking no one’s economic advice but his own. Turkey also announced that Erdogan had held a telephone call with Russia’s president, Vladimir Putin, on Friday to discuss economic ties amid the market turmoil, The Associated Press reported. Erdogan, who has often touted his relationship with Russia as a signal that he has an alternative to relations with the West, said they discussed Russian tourism to Turkey.